Most of us working in home studios use 2-way nearfield monitoring. 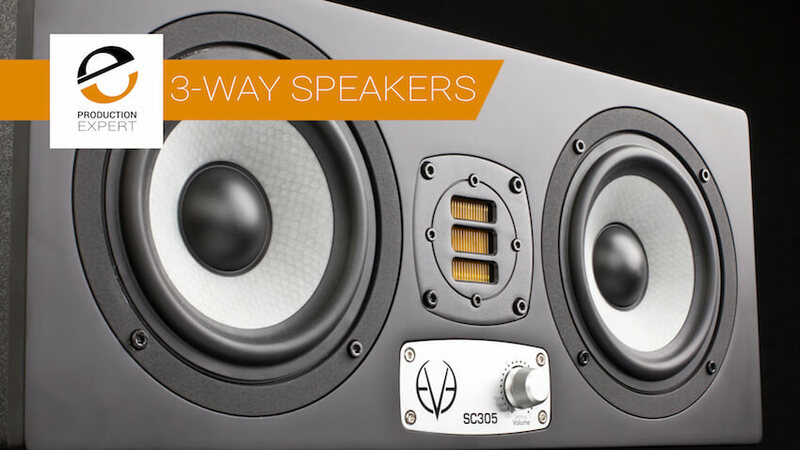 3-way monitors in smaller home studio environments are often impractical for three reasons. First, is cost, second is the physical size of the monitors and third is the size of the room. Eve Audio have a unique solution to 3 way monitoring with their SC305 model, that addresses all these obstacles. Their 3-way system design is a really innovative concept. With the SC305, one of the woofers delivers sound up to 350 Hz, functioning as a kind of "bass woofer". The other woofer gives you a fuller range up to the 3000 Hz crossover frequency as a bass-midrange driver. Think about this for a moment. You have two woofers on each monitor dealing with the bass; while one doubles as the midrange driver. This means a huge bass sound, with less physical work for each individual woofer. Each speaker uses two of Eve Audio’s proprietary 5” SilverCone woofers that feature their copper cap magnet system designed to minimize distortion. So on each monitor, you get the two 5” speakers working together, creating the perception that the size of the cylinder pushing air is roughly equivalent to a 7.5” woofer. In other words, you get a bigger frequency response. In this case, all the way down to 50 Hz. Combine this with their rear bass port design, and you get a huge and efficient low-end sound. The SC305 speakers also use their proprietary AMT RS3 tweeter. A bigger magnet drives the tweeter with greater efficiency. Being a 3-way system, there are three 50 watt PWM power amplifiers on each monitor. As with other Eve Audio monitors, there is built-in DSP, easily controlled with their front panel push-button operation and rear panel dip switches. This allows you to filter the monitors as necessary, to work optimally in your physical setup. A great feature on the SC305s is that in addition to the high filter, low filter, and desk filter; there is also a woofer select dip switch. This allows you to swap the position of the woofer and low-mid driver on each monitor. This means that the woofer can be placed either right or left of the tweeter (which is in between the two). This enables you to easily experiment with the woofer being on the inside or the outside of your ideal stereo triangle without having to physically turn the speaker around. For a good stereo image, EVE recommends to position both woofers on the outside.The tweeter in the middle is also great in a surround setup. 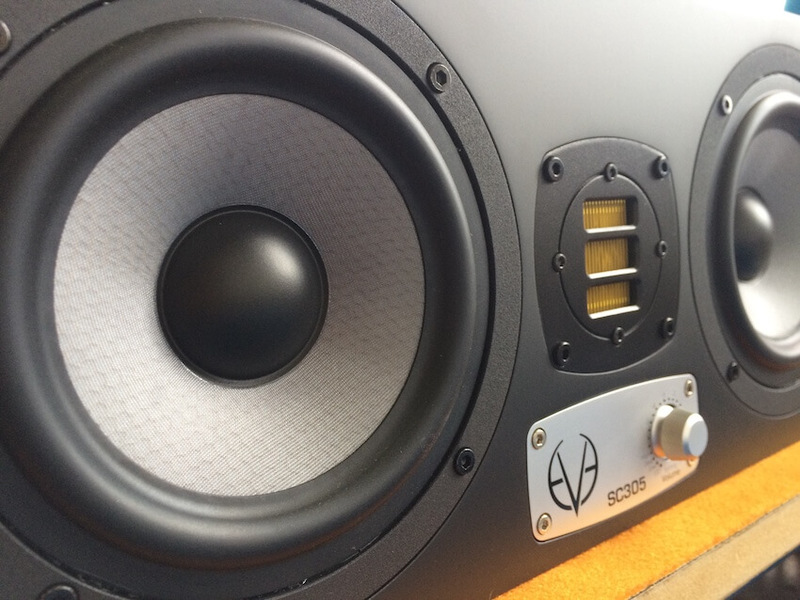 As with other Eve monitors, the SC305 speakers are equipped with balanced XLR or unbalanced RCA connections; as well as with high-quality Burr-Brown A/D converters for their internal DSP. These monitors are a comfortable 16.73” wide, 7.09” high, and 9.84” deep. Set up horizontally, their optimal orientation, they are only about one and a third times the size of laying a regular pair of Eve SC207 near-field monitors on their sides. This isn’t really a significant increase in the required space and should fit comfortably in most near-field monitoring setups. Eve have priced them very competitively; not significantly different from other high-end brand’s 2-way active monitors. All in all, these are a great way to benefit from the huge stereo spread 3-way monitoring brings to the party. Their compact size makes them suitable for modest size desks/stands and listening environments. Check them out here in this video put together by Eve Audio, and you’ll see how they fit nicely into a small studio environment.